Really pleased with the way "Todd" has settled back in. He is enjoying his work. SHAFT (AUS) (Bay 2004-Stud 2008). Winner at 2, STC Silver Slipper S., Gr.2. Sire of 220 rnrs, 145 wnrs, inc. SW Bisou Bisou (Counties RC Auckland Thoroughbred Breeders S., Gr.2), Magic Shaft, SP Erin's Element, Perizada, Selita, Supreme Effort and of Alassak, Flying Tormenta, Such Hope, Gingie, Lightning Bell, Reiby Rampart, Russian Ruby, Flys Away, Golden Mineshaft, Massale, Royal Engineer, Star Shaft, Flight Academy, Mr One Eleven, etc. Squared (f. by Strada). 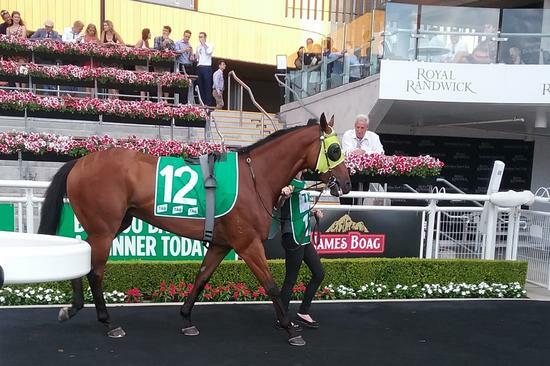 4 wins-1 at 2-to 1200m, A$95,430, to 2018-19 in Aust. Prince Memnon (g. by Shaft). 3 wins. See below. Oh Oh Sun (g. by Dubleo). Placed to 2017-18 in Aust. Lady of Sorrento (f. by Dubawi). Placed at 3 in Aust. Palmera Lad (Tale of the Cat). 6 wins from 1200m to 2100m, A$135,460, BRC Austcover H., 2d BRC Bundaberg Distilling Company H., 3d Gold Coast Guineas, Gr.3, MVRC Smartline H., BRC Bremer Ford H.
Rough Chance (Rock of Gibraltar). 3 wins to 1400m, A$126,260, SAJC Allan Scott Park Morphettville H., CBUS H., AV Jennings H., 2d SAJC City of Marion S., L, Laelia S., L, TRC Bow Mistress S., L, SAJC Australian Peacekeepers Anniversary 2YO H., Schweppes H., Greg Le Poidevin Memorial H., 4th SAJC Yallambee Classic, Gr.2, MRC Twilight Glow S., L.
Formal Attire (Danehill). 3 wins at 1000m, 1250m, A$83,710, MRC Leopardstown H., Rajah Sahib H., 2d WATC Airconditioning Mart H., MRC Always There H., MVRC ME Personal Loan Flying H., 3d WATC Summer Scorcher, L, Perth Meat Exports H., Playeronline.com.au H., MRC Marmion H., MVRC FCM Business Travel H. Sire. NOTONYOURLIFE (Sebring). 6 wins to 1200m, A$359,630, to 2017-18, Qld Tatt's RC Ubet Classic, L, Hardy Brothers Jewellers H., BRC Commercial Hotel Nambour H., Aitkenvale Family Health H., Gallopers Sports Club H., 2d BRC Nudgee S., L, Kanga Couriers H., 3d BRC Nudgee H., L, VRC Leadwest 2YO P., Qld Tatt's RC Osher's H., 4th GCTC Silk Stocking H., L.
ATEATES (Zeditave). 6 wins-2 at 2-to 1200m, A$644,745, AJC Silver Shadow S., Gr.2, Expressway S., Gr.2, MVRC Champagne S., Gr.2, SAJC Yallambee Classic, Gr.2, STC Jasdell 2YO H., 2d AJC Challenge S., Gr.2, MVRC Norman Carlyon S., Gr.2, AJC Brian Crowley S., L, 3d SAJC Goodwood H., Gr.1, AJC Stan Fox S., Gr.2, Challenge S., Gr.2, STC Magic Night S., Gr.2, Sweet Embrace S., Gr.3, MVRC Ian McEwen Trophy, L, 4th AJC Galaxy H., Gr.1, TJ Smith S., Gr.2. Producer. BOSS LANE (Dubawi). 9 wins-1 at 2-to 1250m, A$688,210, ATC Brian Crowley S., L, Can Assist Winter Dash H., July Sprint H., Summer Sprint H., William Shaw Knitwear H., Xirrus H., 2d ATC Show County H., Gr.3, 3d ATC Challenge S., Gr.2, Show County H., Gr.3, Southern Cross S., Gr.3, Fireball S., L, Razor Sharp H., L.
TRUE GLO (Brief Truce). 9 wins-2 at 2-from 1100m to 1600m, A$695,325, Queensland Guineas, Gr.2, STC Ajax S., Gr.3, BTC Sprint H., Gr.3, MRC Tupperware Cup, L, MVRC Waterford Crystal Trophy H., MRC Carlton Draught H., La Trobe 2YO H., 2d VRC Emirates S., Gr.1, MVRC Manikato S., Gr.1, Valuebet H., AFL Grand Final H., 3d STC Canterbury S., Gr.2, MRC Victoria H., Gr.3, Grand Cidium H., 4th MRC Toorak H., Gr.1, BTC Doomben Classic, Gr.3. Race Record: 17 Starts 3-0-1 A$60,095. 3 wins at 1300m, 1600m in Aust.